A century old Indian condiment rediscovered by today's clever cooks. Zesty, flavorful and enticing, Sun Brand Chutney tastes great in a variety of dishes and is so versatile that you will want to use it every day. 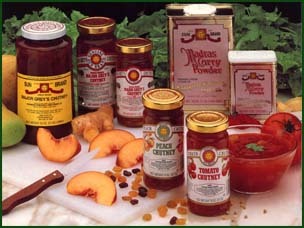 Sun Brand Chutney is now available in Cranberry, Peach, Tomato and the traditional Mango. Start with our recipes & ideas....Then see how creative you can be with yours.